Your 'SECOND HOME' is located at 620 Second Street. Just 2 blocks from down town Harbor Springs. Where you and your pets can stay at an affordable price! YES! Your pets are welcome! Shopping, dining, beach, marina and church are all within walking distance. 5 Miles to Nubs Nob and Boyne Highlands Ski Resort. WI-FI! A nice little "office" area outside the back bedroom. Enjoy our secluded patio while cooking on the NATURAL GAS BB-Q grill. Never have to worry about running out of gas! The large yard is great for kids to play & animals to run. The yard is not fenced in. We do have a cork screw style anchor and chain for the dogs! The house sleeps 4 comfortable. The back bedroom has a very comfortable queen size bed, closet, flat screen Smart TV with DVD player and plenty of space. The front bedroom now has a twin size bunk beds. There is a trundle bed underneath. Makes the bottom bunk into a King, but it leaves absolutely NO room to walk around! Not going to kid you! We can have it set up if you request prior to your arrival. We just remodeled the front and back bedroom. Our Living room has a flat screen TV and DVD. Harbor Spring truly is a great place to vacation. Come stay at your 'SECOND HOME' any time of the year! Every season in Harbor Springs has something wonderful to offer! Skiing information: We are located approx. 5 miles from Nubs Nob & Boyne Highlands ski resorts. Both resorts offer Down hill and Cross country skiing, snow boarding and snow shoeing trails. Chestnut Valley has night Cross Country skiing trails that connect to Nubs Nob trails. Golf information: There are too many Golf courses to list them all! Boyne Highlands, Chestnut valley, Springbrook, Little Traverse Bay Golf course, Harbor Point (semi-private), Birchwood the list goes on and on! Christmas season: Thanksgiving weekend is when the Christmas tree is set up downtown. Santa arrives in the afternoon for the children. In the evening here is a tree lighting ceremony where everyone sings Christmas carols before they light the tree! You have to attend on of these! It's like a Norman Rockwell painting! December hosts the Annual Christmas Open houses. Harbor Springs is on the 1st Wednesday of December while Petoskey holds theirs the 1st Friday of December. This is when the stores downtown are open from 6:00pm to 9:00pm and offer seasonal goodies and drinks! This is a beautiful time to be here! Small town festivities! I have 2 beautiful daughters! Amelia and Grace! We currently live just around the bay in Charlevoix, MI. We like to come to Harbor Springs for the 4th of July, Christmas Tree lighting ceremony and the Annual Christmas Open House. My Grandpa built this house back in the 50's. It's been in the family the whole time. I bought this house when I was 20 years old. In 2001, I had to move to Charlevoix for work, I didn't want to sell the house. I decided to turn it into a vacation rental. I don't have a lot of money. I am not trying to 'make' money off of it. I just need it to pay for itself in order to keep it! I like to keep the price down so EVERYONE can enjoy Harbor Springs! Although Harbor Springs is considered a destination for the wealthy, we'd like to keep it affordable so average people can vacation too! My house is nothing 'fancy'! Keep that in mind as you drive past all the big, fancy houses on Main Street! However, the house is very comfortable, clean and in a spectacular location. One of the main 'unique benefits' or our house is, WE ALLOW ANIMALS! However, our location is everything! Our house is located just 2 blocks from down town. Located behind the Holy Childhood Church, you can faintly hear the church bells in the morning! Close enough to town to walk to dinner, church and the beach. Yet far enough out to be quiet and relaxing! The bathroom was completely remodeled in 2011. We provide hand soap and towels, except beach towels. Please do not take our towels to the beach! We have lost too many in the past! The city beach is only 1 block from the house. New ones installed Spring of 2019. Laundry soap provided too! Driveway is concrete and could park up to 4 vehicles. All towels, hand towels, bath towels and wash cloths. Everything Except beach towels. Please run the dishwasher before you check out. Soap is provided. Our fridge is a small, but seems to be fine. We've never had a complaint about it! Electric......someday we will upgrade to gas! 12 cup maker AND we provide coffee! Some spices, salt, pepper, condiments, coffee and sugar are provided. We have most everything you need. If you need something special, please ask to make sure. 4 chairs and 1 bench seating. We have a FEW games, not many! Coloring books and crayons too. Feel free to weed and water if needed! Paver stone patio. Rectangle table with 6 chairs and NATURAL GAS grill. Such a cute little cottage in a perfect location!! This was our second time staying here and just loved it! We were there to go skiing at Boyne Highlands and it's just a 10/15 minute drive away. The cottage was perfect for our family of four. Had everything we needed. My husband loved going to Johann's every morning for fresh bagels, and I enjoyed my walk through the nearby neighborhood with gorgeous homes and lots of woods! Would definitely stay there again!! Cozy little Cottage. Great location near downtown Harbor Springs and quick drive to Nubs Nob. 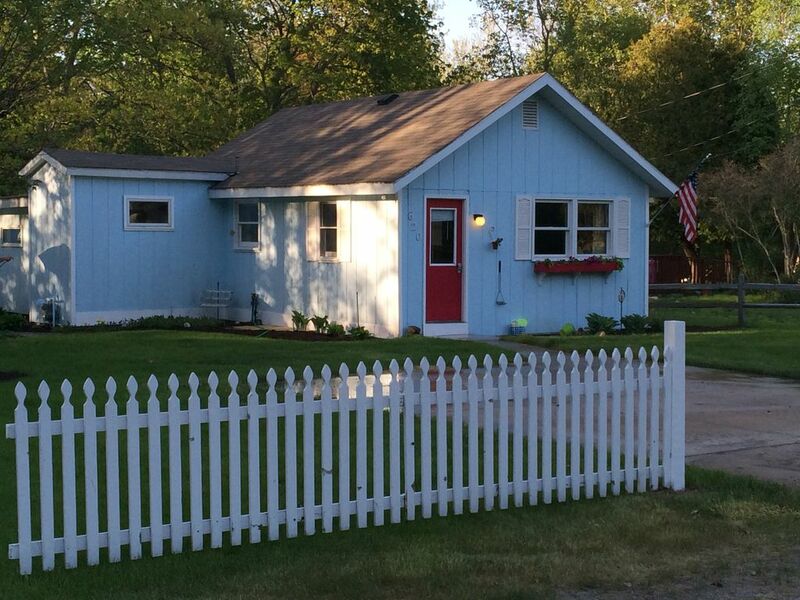 The cabin is cute, cozy, well maintained, not overly priced, and in a great location. If you turn right out of the drive and walk down the road it is absolutely beautiful as you end up surrounded by a nature preserve. Our bigger issue was the cleanliness. There were random hairs everywhere - from the bath tub to the silverware drawer to in a coffee cup. Granted, the owners are kind enough to allow pets, these appeared more human. The other issue revolves around cleaning too. The owners ask that you pick-up, run and empty the dishwasher, vacuum, strip the linens and put them in the washer (dry them too if you have time) because they clean the cabin themselves. That is cool, but then why the cleaning fee? Overall, it is a great place for a small family to have a great Harbor Springs experience for a reasonable price. Just be prepared to allow time to clean before you leave and be charged for your efforts. Hi Roger, sorry to hear about the cleanliness, First I’ve heard of this. I will make sure it’s looked after. We charge a cleaning fee and “request” that you help with some of the cleaning. Only thing we require is that you rhave n the dishwasher, because t takes a while to complete. If you look at ANY vacation rental, they have the same policie. Glad you had a nice stay regardless. Small but well laid out. My wife, the dog, and I had a great ski weekend get away in Harbor Springs. Nice to have our own kitchen & bring the dog while close to the ski hill. Overall had a great trip and will book again next year. Wonderful location. Quiet end of town, located next to nature trails and just blocks to town shops and restaurants. Also an easy drive to ski areas. House is well equipped, if you would like to cook. Bed was comfy, the room was large enough for all our bags/gear. Our dog also enjoyed the stay, lots if places to go for a walk! Only suggestion would be to enhance the tv watching/just relaxing in the living room the sofa could be more supportive. Summer in Harbor is absolutely beautiful and offers a variety of golf courses, fishing, boating, shopping, dinning even a sk8 park! You can ride your bike from Harbor Springs to Charlevoix on the paved bike path that hugs the Lake Michigan coast! Winter in Harbor offers GREAT downhill and cross country skiing, snowmobile trails, snow-shoeing, sledding and ice skating. Don't miss the annual Christmas tree lighting ceremony, the Christmas 'Open House' on the 1st Wednesday of December!